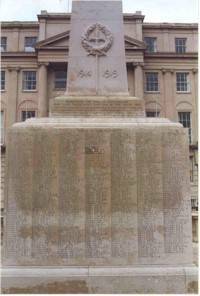 The memorial is located in the centre of the long garden, the Promenade, Cheltenham, Gloucestershire, England. Obelisk designed by R.L. Boulton & Sons of Cheltenham. The three steps to the memorial are of local Leckhampton stone, the remainder being of Portland stone with four faces containing over 1200 names. The photograph shows the east elevation. Names are engraved on all four faces of the memorial. Record and photograph taken in 2000 by John Hyde. IF THEY WERE STRANGERS TO ONE ANOTHER HERE IN THEIR COMMON HOME. THEY SERVED AND WROUGHT AND DIED IN MANY LANDS NEAR AND FAR AS A BAND OF BROTHERS . LEARN FROM THEM SO TO LIVE AND DIE THAT WHEN YOU HAVE FOLLOWED THEM AND ARE NO MORE SEEN YOU MAY LIKE THEM BE REMEMBERED AND REGRETTED. ABBOTT LIEUT. G.D. 1ST CON. RANG. ADAMS LIEUT. H.I. HANTS. R.
ADCOCK PTE. H.P. R.N. DIV. ALDRICH 2ND LIEUT. A. WORC. R.
ALINGTON CPL. G.W.S. LOND. R.
ALLENDER 2ND LIEUT. J.H. LOND. R.
ANDERSON CAPT. E.G. 3RD AUS L.H. ANNESLEY MAJ. W.R.N.D. SO. BERKS. R.
ARMSTRONG LT. C.P. 34TH SIKH PNRS. ASHCROFT PTE. W. L. N.LANCS. R.
ASTON CPL. J. COLDM. GDS. ATKINS PTE. E.H.A. 12TH SOM.L.I. AYERS DMR. E. 2ND R. LANCS. R.
AYERS PTE. L.F. MIDDLESEX R.
BAIRD CAPT. B.H. HIGHD. L.I. BAKER PTE. W.A. CAN. INF. BALDWIN PTE. F.J. DRISCOLL'S F.
BALLINGER L.CPL. F.R. NORF. R.
BALL PTE. S.G. 7TH R. FUS. BANNERMAN CAPT. O.W.E. 15TH LAN. L.A.
BARNETT PTE. E. DEVON R.
BARNETT LIEUT. L.K. YORKS. R.
BARNARD 2ND LIEUT. E.A. R.F.A. & R.A.F. BARRETT 2ND. LT. W. (M.M.) R.WAR.R. BARTON PTE. C.F. AUS. INF. BASTIN 2ND. LT. E.C. R.WAR.R. BATES BUG. H.J. 43RD CAN. HDRS. BAYLEY CPL. A.C. 16TH CAN.I. BEARD PTE. G.A. DORSET R.
BEAMES CPL. W.E. LEINSTER R.
BEASLEY PTE. J. TRAINING RES. BELCHER PTE. A. 54TH CAN R.M..R.
BENDALL PTE. L. HEREFORD R.
BILLINGS PTE. S.W. 19TH R.FUS. BOWCHER CAPT. W.H. 2ND MANCH.R. BOWLES CPL. W. 19TH HDS. BOYLE CAPT. E.A. (M.C.) CAN.E.F. BRAMWELL CAPT. C.C. SCOTS. R.F.S. BRAZENER L.CPL. C.E.A. DEVON R.
BRAZIL PTE. F.C. CHESHIRE R.
BREN LT. H.A.H. LEICESTER R.
BRILL SGT. P.H. MIDDLESEX R.
BROOKES PTE. W.H. 1ST WORC.R. BRODIE LT.COM. S.T. SUBNE.E. 15 R.N. BRODIE CAPT. P.W. SEATH.HRS. & R.A.F. BROOKE-MURRAY CAPT. K.A. A.S.C. & R.A.F. BROWN LIEUT. K. 5TH R.WAR.R. BROWN PTE. J.F. 20TH AUS.I.F. BRUNSKILL 2ND LT. J.J. WORC.R. BRYON PTE. G.H. DURHAM L.I. BUBB PTE. F. 7TH SHROP.L.I. BUCKELL 2ND LT. C.J.A. NORF.R. BUNCE 2ND LIEUT. G.O. S.W.B. BURGOYNE-WALLACE LT. D.B. 7TH RAJS. LA. BURTON LT.COL. A.R. 94TH RUS.INF.LA. BUSHELL RFN. F.H. 10TH K.R.R. BUTLER PTE. F.W. 14TH R.WAR.R. BUTLER PTE. F.V. 1/5 WELSH R.
CALEY PTE. A. 1/8 LANC.FUS. CAMPBELL LT. IAN P. CAM.HDRS. CANDY C.S.M. J.D. D.O. CORN.L.I. CAREY PTE. G.W. 2ND COLDM.GDS. CARTER PTE. E. 6TH BERKS.R. CASCARINO PTE. L. R. W.KENT.R. CHAMBERLAIN BTY. S.M.C. (M.M.&BAR) R.F.A. CHANDLER CPL. H.C.P. 5TH CANDS. CHESHIRE L.CPL. W. OX. & BUCKS.L.I. CHESTER-MASTER LT.COL. R.C. (D.S.O.) K.R.R. CHIDLEY CPL. E. 1ST AUS.INF. CLARE PTE. F.C. 28TH CAN.INF. CLARK RFN. L.H.H. 2ND Q,VICT.RIFS. CLARK PTE. L.B. 16TH CANDS. CLAUGHTON LT. IAN D. 11TH SUF.R. CLAYTON PTE. G. 2ND R.BUCKS. COLE PTE. N. OX.& BUCKS,L.I. COOCH LIEUT. C.R. 2ND BORDER.R. COOK 2ND LT. C.R. HANTS.R. COOPER PTE. C.S. 26TH R.FUS. COOPER PTE. H.T. 10TH SHER.FOR. COPESTAKE PTE. F.J.V. DEVON R.
COUSINS PTE. T.F. DEVON R.
COX PTE. C. 1ST WORC.R. COX PTE. L.H. ESSEX R.
COX CAPT. J.RAMSEY 6TH WORC.R. CREED SGT. T. 9TH LANCS.FUS. CRESSWELL CAPT. H.E. E.KENT R.
CROOKE 2ND LT. H.N. R.E. CROOK PTE. W. N.ZEALAND I.
CRUSE PTE. C.E. 2ND CAN.M.C.C. CUMMINGS PTE. A.G. 1ST ARTISIT R.
DAFFURN PTE. A. 11TH W.KENT R.
DAVIS CPL. A.J. NORFOLK R.
DEAN PTE. S. DORSET R.
DENLEY PTE. E. DEVON R.
DENNIS PTE. C. A.CYCLIST C.
DESAGES CAPT. W.R. 2/5 E.LANC.R. DESAGES 2ND LT. O.L. 1ST WILTS.R. DICKS 2ND LT. F.J.N. WORC.R. DOHERTY-HOLWELL LT.COL. R.V. (D.S.O.) R.E. DRAKE SGT. W.S. OX.& BUCKS.L.I. DREW SGT. E. (M.M.) M.G.C. DRIVER L.CPL. H. 1ST R.WAR.R. DUBOULAY COL. A.H. (D.S.O.) R.E. DUBOULAY 2ND LT. H.L.H. WILTS.R. DYER PTE. S.E. A.CYCLIST C.
DYER 2ND LT. A. R.A.F. EAGER 2ND LT. D,C, R.F.A. EAGER PTE. J.P. 3RD MONMOUTH R.
EDEN L.CPL. W. 1ST WORC.R. EDWARDS CAPT. C.O.R. (M.C.) R.E. ELLIOTT 2ND LT. J.H. R.WAR.R. ELLIOTT 2ND LT. P.L. D.O.CORN.L.I. FAULKNER PTE. A. WELSH R.
FAULKNER PTE. F.R. WELSH FUS. FEATHERSTONE 2ND LT. M.B. R.E. FISHER PTE. C.G. 2/8 WORC.R. FISHER PTE. E.V.R. LABOUR C.
FISHER CAPT. E.W. THE PUNJABIS LA. FISHER PTE. W.E. 1/4 WILTS.R. FLYNN PTE. T. YORK.& LANC.R. FOSBERY 2ND LT. F.T. M.G.C. FOSTER PTE. C. ESSEX R.
GAMMON PTE. E.T. 2ND WORC.R. GARDNER 2ND LT. F.G.B. R.F.A. GARDNER LT. COL. H.M. LINCN.R. GARDNER 2ND LT. W.S. R.F.A. ATT R.A.F. GARDNER PTE. W. 2ND WORC.R. GARAWAY RFN. P. WINNIPEG RIF. GEDDES BRIG. GEN. J.C. R.A.
GEIDT LIEUT. C.A. CAM HDRS. GIBBS PTE. E.B. 1/5 R.W.KENT.R. GILLIAT CAPT. R.H.C. 5TH LEIN.R. GLOSTER LIEUT. C.C. 1ST DEVON.R. GODDARD PTE. W. 10TH WORC.R. GODLEY 2ND LT. G.A.G. R.A.S.C. GODSELL PTE. F. 9TH R.WELSH F.
GREEN PTE. C. 13.WELSH R.
GREEN PTE. W.J. LAB. BATT. GREGORY PTE. J. WELSH GDS. GRESSON 2ND LT. J.E. 3RD CHES.R. GRIFFITH LT. R.V. DE BURGH R.FUS. GRIFFITH MAJOR J.G. 32ND LAN. GRIFFIN PTE. E.F. 8TH DEVON R.
HAILSTONE CAPT. R. R.WELSH F.
HALL SGT. H. 3RD DRAG.GDS. HALL CPL. F.C. 14TH HUS. HALL PTE. C. 2ND DURHAM L.I. HALL PTE. C.A. DURHAM L.I. HARDING SGT. C. 15TH WELSH R.
HARRISON LIEUT. C.C. 3RD WORC.R. HART PTE. C.R. 1ST SEA HDRS. HARWOOD PTE. C.W. DEVON R.
HAY LIEUT. D.W. (M.C.) MIDDLEX.R. HAYCOX PTE. B. 1ST DORSET R.
HELLINGS PTE. N.S. 1ST CAN.PNRS. HENNESSEY L.CPL. C. 4TH S.W.B. HILL PTE. F. WELSH R.
HILL PTE. P. 1ST WELSH R.
HIRST 2ND LT. C.P. DEVON R.
HODSON 2ND LT. R.C. R.E. HOLE 2ND LT. M. K.R.R. HOLMAN CAPT. A.V. HEREFORD R.
HOLMES 2ND LT. T.C. R.F.A. HOLTHAM PTE. J. 1/8 MANCH.R. HOOPER PTE. B. 3RD S.W.B. HOUGHTON PTE. A.H. 9TH WELSH R.
HOWELLS 2ND LT. G.J. R.A.F. HOWES PTE A.H. 1ST DEVON R.
HUDSON 2ND LT. F.H. 1ST WORC.R. HUNT PTE. G.C. 6TH WORC.R. HURST SGT. C. 2ND WILTS.R. IEVERS LT. CPL. G.G. I.A. JACKSON 2ND LT. S.S. WORC.R. JOHNSTON MAJOR H.B.N. (D.S.O) R.A.
KING PTE. A.P. 2ND.OX.& BUCKS.L.I. LARNER CPL. E.A. YORK.& LANC.R. LAWRENCE TOWNSEND CPT. R.E. MID.R. LEWIS PTE. T.F. 4TH. S.W.B. LOCK 2ND. CPL. E. R.E. LONG PTE. E. 2/5 LOND.R. L.R.B. MACKAY CAPT. D.R.G. (D.F.C.) R.A.F. MAISEY 2ND. LT. A.G. R.W.SUR.R. MALLETT 2ND. A/M C.J. R.A.F. MARSHALL 2ND. LT. A.N. BEDRD.R. MARTIN PTE. W.S. 2ND.YORK &LANC.R. MATHER LIEUT. J.K. YORK & LANC.R. MATHER 2ND. LT. R. K.LIVERP.R. MILES PTE. R. R.A. F&K. LIVERPL. MILLS 1ST. CL. STOKER F. R.N. MOTT 2ND. LT. L.W. R.A.F. MOUATT-BIGGS 2ND. LT. E. 1ST.LINC.R. MUSGROVE 2ND. LT. G.H.S. E.SUR.R. NOAKE LT. COMM. B.S. R.N. OAKLEY BROWN LT. V. DRAG.GDS. O'CALLAGHAN LT. D. MCKMcD. D.C.L.I. PAGE FL. LT. H.J. R.N.A.F. PAINTER LT. A.E. WORC.R.& R.E. PARKER PTE. G.L. LABOUR C.
PEARCE LT. N.A. TRAINING RES. PEMBERTON CAPT. V.T. (M.C.) R.G.A. PIGOTT 1ST. CL. P/O R.A. R.N. POPE CPL. C.H. HOUSEHOLD BN. POWELL LT. COMM. A.F. R.N. PREECE L.CPL. F.E. 2ND. DEVON.R. READ CAPT. A.M. (V.C.) N.HANTS.R. REYNOLD MAJOR D. (V.C.) R.F.A. RICHARDS PTE. T.C. YORK. & LANCS.R. RIVERS PTE. E.W.C. OX. & BUCKS.L.I. ROGER 2ND. LT. S.G. DEVON.R. RUSSELL 2ND. LT. N.J.G. R.F.A. SANDERS 2ND. LT. J.E. LANS.F. SHELLAM PTE. C. OX. & BUCKS.L.I. SKEEN PTE. T. R.W.KENT R.
SMITH CPL. A.F. 13TH.R.IRISH R.
SOUTHCOMB 2ND. LT. E.H. MANC.R. STAINFORTH 2ND. LT. R.T. R.WAR.R. STIBBS PTE. J.A. OX. & BUCK.L.I. STRACHAN LT. A. CHINESE LAB.C. STRACHAN 2ND. LT. A.C. R.F.A. SUCH BAND SGT. H. R.GLOS.R. SWINLEY MAJ. G.D. 14TH.SIKHS I.A. TARONE PTE. A. DORSET R.
TERRY LT. COMM. F.G. R.N. THORNTON 2ND. LT. G.R.H. R.G.A. TURNER CAPT. H.C. CHESHIRE R.
VANRENEN LT. COL. A.S. 5TH.INNISK.F. VAUGHAN CAPT. C.G. DEVON R.
VOILE GNR. M.C. M.G.C. TANK.C. WALKLEY PTE. A. 1/23 LOND.R. WARD LT. COL. B.E. MIDDLEX.R. WEAVER RFN. L.H. 1/21 LONDON.R. WELLS PTE. S.C. 2/7 R.WAR.R. WILKINS PTE. J. 2/5 W.YORK.R. WILKS SGT. C.P. 1/3 HIGHD.F. AMCE. WINTER CPL. P. 1ST.BEDFORD R.
WRIGHT PTE. G.R. 1/7 R.WAR.R. YEANDLE CPL. W.H. 14TH. R.WAR.R. GLENNY H.Q. DIST.OFF. N.NIGERIA W.A.F.F. UZZELL 2ND.LT. L.C. 2/5 R.WAR.R. ELLIOT ST.SGT. S. R.A.S.C. M.S.M.